Research by the American Academy of Pediatrics shows that reading daily to young children stimulates early brain development and helps build key language, literacy and social skills. In celebration of National Literacy Month in September, McDonald’s USA is inviting families to celebrate the joy of reading with the launch of the latest Happy Meal Books promotion. Happy Meal Books will be available in restaurants nationwide from September 5-18 helping spread the gift of reading to families across the U.S.
McDonald’s is also a proud supporter of Reading is Fundamental (RIF), the nation’s largest children’s literacy organization, which seeks to promote literacy by making it easier for children throughout the country to have access to interesting, captivating reading materials. 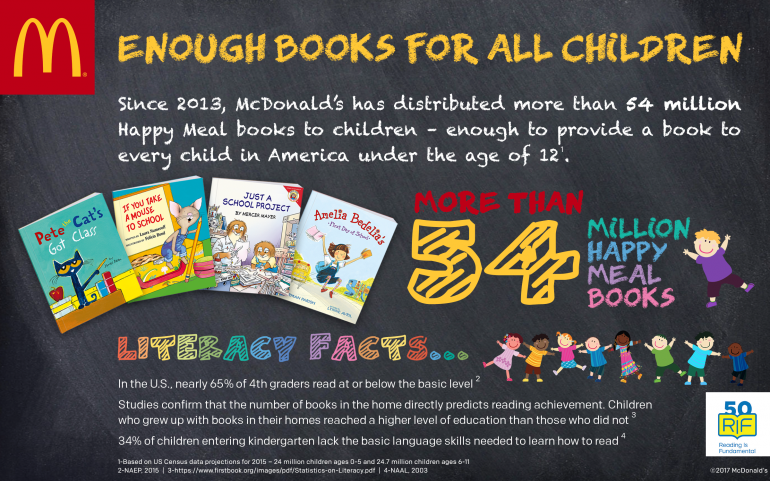 By 2018, McDonald’s will have donated approximately 400,000 books from the Happy Meal Books promotions to RIF literacy efforts and programs across the country.